Wanna be a dangerously bold archerist like Katniss Everdeen? Don't we all. Get in touch with your inner survivalist with archery lessons that will teach you the physical form and mental focus you need for recreational, competitive, or hunting success. Under the watchful eye of experienced coaches, your first steps into archery will be safe and carefully guided. And hey, if Jennifer Lawrence could learn it, so can you. May the odds be ever in your favor. Note: All equipment is included in the price of this booking. The minimum age of each participant must be 9 years and older. There will be a 10% cancellation/rescheduling fee for any changes made prior to 24hrs of your reservation. There is no cancellation or reschedule within 24 hours of your reservation. Super fun! Would recommend it to anyone, I expect to return. The instructor made it an enjoyable and safe experience. I also enjoyed the fact we were allowed to shoot from further distance. Overall fun time! I had an amazing experience. My friend and I found the class very informative and entertaining. Definitely something we will be looking to do again. Instructor was fun and attentive and we got plenty of time to practice shooting from various distances. Would definitely do again! It was a fun activity for the family. The instruction was great, with ample of time to put the instruction to use. It’s also a great deal, an activity for 1.5 hours that is under 30 dollars! Great fun! My wife and I loved the lesson and really enjoyed our experience. Such an awesome time and Mike, the instructor, was awesome! Will definitely be back there soon! Loved it!!! We had a blast. Nate was an amazing instructor with tons of personality which added to the experience. We are going again soon!!!! The instructor was fun and he made it very easy, it was a very fun activity that we probably wouldn't have thought of doing if not through Vimbly, and the price was very reasonable. Had so much fun!! Simon was a great teacher! Will definitely do again! Mike, the instructor, was wonderful. Personable, funny, and very attentive to each and every one of us. I highly recommend this activity. Mike is an instructor during the weekends. The instructor (Mike) was very fun and a great teacher. Very experienced and has a true love for the sport. Very clear and efficient instruction. I think everyone not only felt safe but had fun too. Mike the instructor was great. Great instructors! Will be back again soon! Great place to vist, great experience. I think I will go there on the regular now. This place is the closest place you're going to get to shooting something in Queens, without a permit and without any hassle. You have a choice to shoot a Recurve or Compound bow. Beginners usually get Compounds but if you want to have more fun, think your a little bit more experienced, or just like challenges ask for the Recurve Bow. After the little training session for beginners or first time shooters they basically give you free reign on shooting you just have to wait for the rest of the group to finish firing and then you can go fetch your arrows. Trust me you will not leave this place wishing you had shot more! It's a blast for dates or for casual friendly outings. This place had lots of open space but felt kind of dingy. I attended a beginners class with 20 something people, and we all stood side by side in a row with a partner behind us, and it felt a bit tight. I would have preferred a little more space to move around but overall it was enough to perform the task. The equipment rental was provided in the deal, and I'm glad they also had arm bands available. The arm band protects your arm from getting hit directly by the bow after the arrow is released, so it can prevent major bruising from occurring. 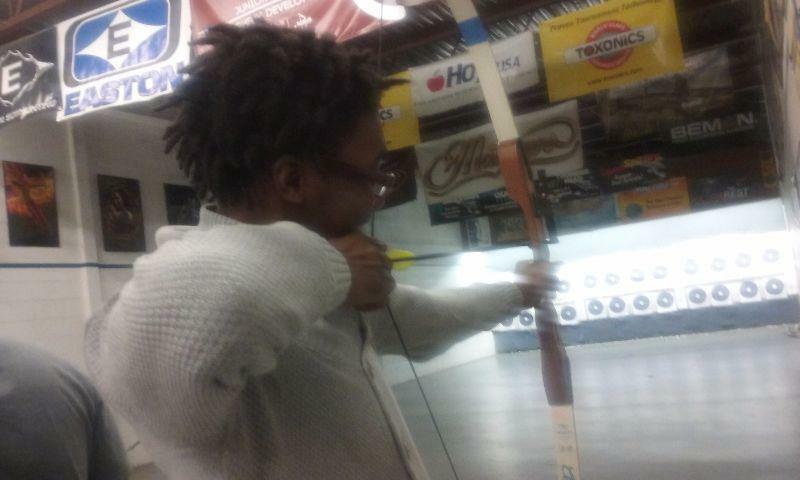 I really had a great time here and archery is a fun activity with friends. A fun experience. Nothing special except a bow, arrow, and a target. But it was something different to do. Was a nice experience. This place was great. Mike, our instructor, had a great sense of humor and made it very easy and fun to learn. I would recommend this place for many different occasions. Had a really good time and will be going back. Great place to spend a Friday night... Good friendly folks running the place and genuinely want to make sure you have the best time. I'd totally come back with my wife. Friendly and knowledgeable staff. They knew and understood their audience, from pros to first-timers. I had so much fun here. Definitely will come back again.